Can you name the place that combines excellent beach vacation, awe-inspiring sightseeing opportunities, world-famous health resorts, fantastic natural phenomena and a unique diversity of regions and cultures? No matter what kind of recreation you are looking for - Turkey will give you a thousand and one attractions to discover. Istanbul's Grand Bazaar is not just a simple market, it's a real city within a city. Covering a total area of about 30.000 square meters or 60 streets it houses over 4.000 shops, two mosques, four fountains, two hammams and a number of dining options. You will find everything you need here, but the best idea is to pay attention at those items the Turks are most famous for: spices, jewelry, hand-painted ceramics and carpets. Tip: Don't hesitate to try your hand at the art of bargaining and kill two birds with one stone: get the best bang for your buck saving up to a half of the initial price and keep up the centuries-old tradition. Please note that the market is closed on Sunday. The most recognizable symbol of Istanbul listed at the top of all city's landmarks, the Blue Mosque is simply stunning. Originally known as the Sultan Ahmed Mosque it was dubbed the Blue Mosque due to its eye-pleasing interiors decorated with blue Iznik tiles that will impress even the most sophisticated sightseer. To enhance your experience of the mosque we recommend to take a walk at its gorgeous inner and outer courtyards where you can feel the grandeur of this sacred place. Tip: The Blue Mosque is closed to tourists during prayer times. If you hear the call to prayer over the loudspeaker it's better to avoid visiting the mosque within the next half an hour. Your visit to Istanbul won't be complete without an exploration of a real treasure of the Black Sea region - the Bosphorus Strait. Running through the heart of the Turkish capital, it divides Istanbul into two equal parts - the European and Asian one. For many centuries it remains the primary trading artery and the most strategic waterway for Turkey. No wonder that the shores of the Bosphorus are surrounded by fine neighborhoods abundant in beautiful mosques, palaces, restaurants and hotels. Tip: The greatest way to experience the Bosphorus Strait in all its splendor is to take a traditional boat cruise. There are a variety of options that can fit any taste and budget. When you first see its surreal moon-like landscapes, “fairy chimneys” created by a centuries-long wind and rain erosion, and entire towns with churches and fortresses carved into the rocks, it seems that you're on another planet. No words and photos are enough to describe Cappadocia - you simply should go there. The most awesome way to experience all this unusual beauty is by hot air balloon. Wake up early in the morning and be awarded with mind-boggling views of the region lit by the dawning sunlight. 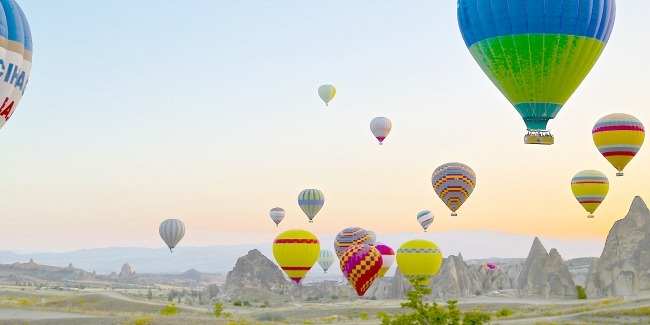 Tip: The best time to fly over Cappadocia is from April through October when the weather conditions are most suitable for hot air ballooning. What looks like a snowy winter resort is actually a popular natural thermal spa with an average water temperature of 35 °C. Why is the Pamukkale landscape is so unusual? It’s all because of the large concentration of calcium in waters flowing down the hills and forming a fanciful system of white travertines and pools. Most of the terraces are closed to the public, however there are several thermal springs, like Cleopatra’s pool, where you can take a dip at the warm water famous for its curing properties that can help recovering numerous diseases, including high blood pressure, rheumatism and kidney stones. Tip: Grab an opportunity to pop in the nearby city of Hierapolis to discover its historical Roman ruins. Can you only imagine the entire complex of underground cities with houses, churches, schools, livestock stalls and wells stretching for miles and miles? If you think it's impossible, then go to Cappadocia region that has over 40 subterranean towns built during the Bronze Age for protection and religious purposes. Although all these cities are currently undergone archaeological excavation, six of them are open to the public. Tip: We recommend to visit Derinkuyu - the deepest of Cappadocia underground cities that now reaches the depth of an eight-storied building and is believed to contain up to 18 subsurface floors with an intricate system of tunnels, caves and ventilation shafts. A mystical sanctuary located at the top of Mount Nemrut off the well-beaten tourist track is definitely worth a visit. It consists of a 50 m high burial mound to King Antiochus I surrounded by artificial terraces. East and west terraces are decorated with colossal limestone statues representing the pantheon of Greek and Persian gods and King Antiochus I himself. All the statues are decapitated that adds a mystery to this sight, as no one knows who, when and why separate their heads from the bodies. Tip: Stay overnight at a local hotel and come to Mount Nemrut at dawn to get mesmerized by picture-postcard views and serenity of the surrounding landscapes. Don't forget to take warm clothes. Nights at this region may be chilly even in summer. The largest port of Asia Minor and the most important trading center of the old Mediterranean world, today Ephesus is considered the best-preserved antique site of Turkey. Here you can still find the ruins of the Temple of Artemis known as one of the Seven Wonders of the Ancient World. Among other incredible sites are the awe-inspiring Library of Celsus, the Great Theater and even 2000-year-old public toilets. Tip: Take a trip outside Ephesus to visit one of the most sacred sites of pilgrimage, the House of Virgin Mary, that is believed to be the place where the mother of Jesus spent her last days on earth until her assumption into heaven. An ancient site located on the northwest of Turkey, Troy became famous due to the Homer's epic poem "Iliad" that contains the myth about the legendary Trojan War. This place is ideal for all history buffs as its ruins, streets and buildings still hold memories about the most beautiful woman in the world, Queen Helen of Sparta, abducted by a lovestruck Trojan prince Paris, a subsequent 10-year-long siege of Troy and its devastating defeat. Tip: Modern Troy is home to a wooden replica of the legendary Trojan Horse - a gift by the Greeks used to enter the city of Troy and gain the victory. Don't miss an opportunity to climb into the Trojan Horse and feel yourself a hero of the "Iliad"! The unique combination of music, dance and spirituality - the whirling dervishes are much more than simple dancers. They are believed to communicate with God through the movements of their bodies. The tradition came from one of the greatest Sufi poets and philosophers, Jelaleddin Rumi or Mevlana ("Our leader"), who whirled ecstatically to gain a unity with God. Today his disciples continue to perform this religious ceremony called sema throughout Turkey. Dressed in long white robes, tall hats and black cloaks dervishes whirl to the strains of Islamic hymns and prayers. This is an absolute must-see. Tip: The best place to see the whirling dervishes is in Konya - the birthplace of the Mevlevi order where the annual festival commemorating the anniversary of Mevlana's death takes place every December. It’s only a short list of attractions that worth your attention. According to your preferences you can choose to explore Turkey solely or combine your travel experience with one of our award-winning tours to Greece and its amazing islands. Pick up the sights you are most interested in and our travel specialists will help you to organize an ideal journey to the Aegean.